Soaring oil prices and the strong Korean won against US dollars were to blame for the economic sluggishness in the first half of this year, but it was world-wide phenomenon rather than Korean one alone, argued South Korea's chief economic official recently. 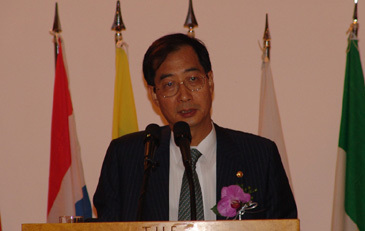 Mr. Han Duck-Soo, deputy prime minister and minister of finance and economy, made the evaluations of South Korean economy in a breakfast gathering hosted by EUCCK (European Union's Chamber of Commerce in Korea) on July 8, 2005. In the meeting held at Shilla Hotel's Emerald Room at 7:30 a.m., Mr. Han delivered a special speech under the title of "Toward Renewed Growth — Economic Policy Direction for the Second half of 2005" in front of scores of high-profile leaders and officials from the nation's business, finance and other economic areas, as well as EUCCK officials. Among the participants were top EU-affiliated ambassadors including EU Ambassador Dorian Prince and British Ambassador Warwick Morris. 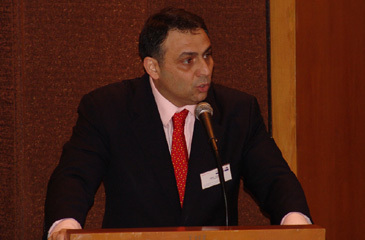 The whole event was officiated by EUCCK's Vice President Philippe Broianigo. 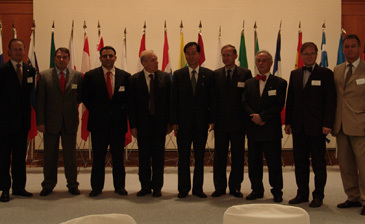 Vice Premiere Han Duck-Soo (center) poses with other dignitaries at EUCCK breakfast meeting held at Shilla Hotel July 8, 2005. Mr. Han gave a cautious optimism about the prospect of South Korea's economic recovery. He said that while the pace of (economic) recovery is not satisfactory, the quality of its growth appears to be improving. The top economic official also said that employment in the first half was gradually improving with more people on payrolls and prices remained stable with consumer prices index in the lower three percent range. As for measures for putting the nation's economy back into its pace, he said that the government will focus on implementing investment stimulus measures to regain growth momentum. The government plans to expand public expenditure and stimulate private investment. Mr. Han said that public expenditure of 3.1 trillion won from public fund and state-run corporations will be poured into such growth stimulating projects as public housing and new town development projects. EUCCK's Vice President Philippe Broianigo is making welcoming address in front of participants for EUCCK breakfast meetng . As a way to reinforce growth momentum, he said that the government will improve investment environment by easing regulations and keeping government intervention to the minimum, thus maximizing the role of private creativity and capacity. Vice Premiere Han said that the government will boost innovation throughout the country by facilitating the establishment of small- and medium-sized companies and venture startups. For this goal, the government will expand credit guarantee support for those startups and high-tech companies in particular. The government will also develope comprehensive measures to open 10 major service sectors including legal, accounting, taxation , and financial services. He said that deregulation on educational and medical industries will also be tried. He also stressed the need for establishing an advanced socio-economic system that is efficient and flexible. The government will push for the changes that will make prudential regulations more market-friendly and operational regulations less burdensome. Mr. Han also touched upon the need for turning the nation into an advanced trading nation by improving domestic rules and institutions into the level of global standards. 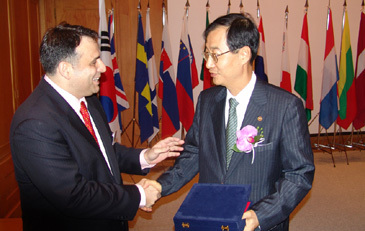 EUCCK's Vice President Philippe Broianigo (left) offers a plaque of appreciation to Vice Premiere Han Duck-Soo at the end of Han's speech at EUCCK meeting at Shilla Hotel July 8, 2005. The government will even work harder to induce more FDI (foreign direct investment), which is vital to the nation's economic growth, according the Mr. Han. Last year nation's cumulative FDI (foreign direct investment) reached 100 billion US dollars. South Korean government introduced tax exemption and reduction to R&D investment that does not entail the manufacturing process. It also bolstered corporate and local tax benefits to corporations in the Foreign Exclusive Industrial Complex up to the level of those in the FEZ (free economic zone)s. "Invest Korea" project is already in operation to provide one-stop services to foreign investors. The vice premiere closed his address by saying that the government will make a tireless effort to turn South Korea into a Northeast Asian hub. At the end of the his speech Mr. Han was presented with a plaque of appreciation from Vice President Philippe Broianigo of EUCCK, the host of the event. Ms. Liz (Yun-Mi) Park serves as staff reporter for The Seoul Times. She studied journalism at the Chonbuk National University. She covers diplomatic area in Seoul as well as other foreign communities in South Korea.